Mei Zuo's Chapter: Mei Zuo (known as Akira in the Japanese version) got his pocket picked by a Japanese girl, Ai Sha, struggling to survive in Taiwan. Ai Sha fools Mei Zuo several times before she finally reveals the truth. Ai Sha, recently left Japan to find her grandmother. Mei Zuo agrees to help her out and after several events take place, Ai Sha and Mei Zuo start to practice dancing together. The explanation for this is that Ai Sha believes the best way to find her grandmother is to enter/win a televised dance contest. At the end of this Meteor Rain Chapter, a romance is strongly hinted. Xi Men's Chapter: Xiao You (known as Yuki in the Japanese version) comes back from Canada by herself on a quest for her love. She attempts to rekindle her relationship with Xi Men (known as Soujiro in the Japanese version) and at first seems to be unsuccessful. After an occurrence at the bar, Xi Men and Xiao You confront each other about their behaviors. Later Xi Men reveals to Xiao You a bit of his past and tells her about this girl, Xiao Geng, he once loved. Xiao Geng had discovered something very special, but he had been somewhat afraid of his feelings and had greatly disappointed her by not showing up. Inspired by the story, Xiao You goes on a time-consuming search for the "special thing" that Xiao Geng had wanted to show Xi Men. 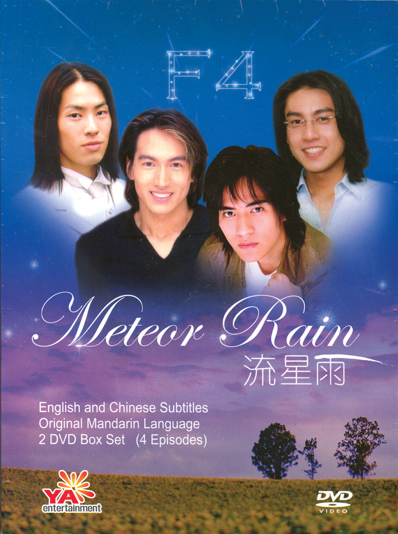 The stories occur before, during, and after the first season of Meteor Garden (a supplement to the first season of Meteor Garden). Hua Ze Lei (the 4th member of F4) did not receive a chapter due to the busy filming schedule of actor Vic Zhou.